In Mandrem, a small fishing village on the northern tip of Goa, the only buzz you hear is of the crickets. A smattering of hotels and beach shacks hidden behind palm fronds, a wide, clear creek running into the sea, and an unspoilt beach that melts into the horizon—Mandrem is everything Goa used to be before it got buried under concrete, plastic and hordes of tourists. Here, serendipity is still an option. 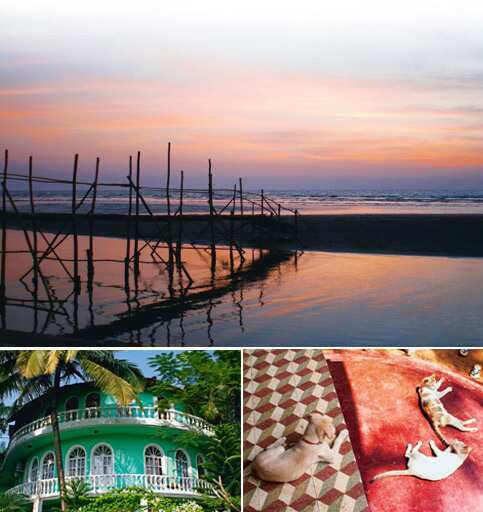 Flashback: (clockwise from top) The calm and secluded Mandrem beach; Villa Rivercat takes in beach-bum dogs and cats; and the sea-green façade of the villa. Photographs by Mandakini Gupta. There are no crowds on this beach—a man with a tiny blonde baby sitting astride his shoulders stands facing the horizon in chest-deep water. A couple wade into the sea, and timing themselves perfectly with the bigger waves, bodysurf back to the shore, and then wade out again. In a far corner, some of the locals are playing a pick-up game of beach football along with a couple of tourists. This could be your own little sun-soaked paradise, the side of Goa that makes the traveller never want to leave. As if all of that was not good enough, there is Villa Rivercat. The sea-green rotunda under a thatched palm cupola is hidden just metres away from the beach behind sand dunes and coconut groves. It shelters human travellers as well as beach-bum dogs, and though Sehgal and his staff of two run the place, the real owners are an extended family of regal, lazy and friendly cats. They keep the dogs in their place, laze in the beautiful semi-circular veranda overlooking a lush tropical garden and the creek, and sometimes position themselves as decorative pieces on antique cupboards, shelves, or the banister of the wide, spiral staircase that leads up to the first floor of the villa. Gently swinging on one of the hammocks that dot the villa’s wraparound balcony, I feel like it’s a quirky ancestral house I’ve inherited. The floor of the villa features intricate Mediterranean tiles, and the walls and corners are dotted with quirky artefacts collected by Sehgal during his travels, or left by visiting artists as gifts. One beautiful but ominous black and white sketch shows the villa post-apocalypse, a massive banyan tree rising from the centre of the house and through the roof, vines entwined across the entire façade, deep jungle all around, and the silhouette of a cat sitting in the open doorway. The one price to pay for this blissful solitude is the lack of good restaurants in Mandrem. After a depressing tour of some of the local joints, I’m convinced that the only really good food is to be found at Dunes—a large beach shack decked with fairy lights, whose Goan fish curries, garlic prawns, recheado and vindaloos are consistently good, with robust flavours and, of course, the freshest of fish. For a truly extraordinary culinary experience, I have to break away from the sleepy cocoon of Mandrem, but that doesn’t take too much effort. A 10-minute motorcycle ride through twisting, tree-lined roads cutting through paddy fields leads me to, without hyperbole, the hippest restaurant on an Indian beach: La Plage, run by a French expat couple. On the menu: rare tuna steak encrusted in toasted sesame seeds with a soy-based sauce; crispy, airy tempuras with three kinds of dips; melt-in-the-mouth sardine fillets with wasabi cream; tiger prawn carpaccio that tastes of the sea in a heady tropical marriage with vanilla-infused oil; and mussels and clams in a wildly aromatic coconut milk broth. The setting: pristine white tables and deck chairs, colourful sheer curtains billowing in the breeze, and a dazzlingly white beach. It’s luxurious, innovative food executed perfectly, amid a setting that money can’t buy. Mandrem beach is actually part of a continuous stretch of beaches that run for roughly 13km, with the Chapora river as the southern limit, and the Terekhol river that divides Goa from Maharashtra the northern boundary. Starting from Morjim in the south, a struggling sanctuary for Olive Ridley turtles, the stretch covers Ashwem, where La Plage is located, Mandrem, Arambol and Kerim. Morjim is populous and dirty, Arambol is a popular hippie hang-out with lots of beach shacks and restaurants and shops—a place to head to if Mandrem gets too quiet, or for the elaborate fry-up breakfast at the Double Dutch Bakery. Lulled by the cool sea breeze and the shaded, winding roads that undulate gorgeously through forested hills and quaint villages, I rode on a bike all the way to the northern limit of Goa (actually, that’s all of 20 minutes’ ride from Mandrem). It’s a place called Kerim—a thin strip of white sand beach, and it’s completely deserted. Only two small shacks are semi-operational. The Terekhol river calmly merges with the Arabian Sea at one end of the beach. The shack, shaded by an unbroken line of coconut trees along the coastline, serves chilled beer and prawns so fresh they must have been alive seconds before they were cooked. Sautéed in lots of butter and garlic, shells and heads intact, with a hint of cumin and red chillies, the prawns are exploding with flavour. They are so good that they demand messy, no-holds-barred, dazed gluttony. A rare moment of culinary magic when you least expect it. From Kerim, I loaded my bike on to the ferry that takes people across the Terekhol river for free. On the other side, just a few kilometres up the hill, is the Tiracol Fort, a former Portuguese citadel turned into a heritage hotel. It is a spectacular setting, the white and ochre fort perched on an isolated cliff which rises straight from the sea, and the hotel allows casual visitors to walk around its ramparts. The path up to the fort is dotted with small family-owned cashew plantations, all making the local brew, feni. If the thick fumes on the road are not heady enough, all the plantations have little plastic chairs and tables set out in courtyards where you can stop by for a drink. Now, feni tempered into a citrusy cocktail makes for an excellent drink, but drinking the stuff straight requires true grit. In these surroundings, though, I didn’t mind a shot or two for the road.